According to the National Multiple Sclerosis Society, as many as 400,000 Americans suffer from multiple sclerosis with as many as 200 more people being diagnosed every week. It is considered an autoimmune disease, as well as a neurological condition, with a variety of symptoms. It is for these symptoms that many Americans are turning to herbal and natural remedies, and patients are not the only ones. Researchers are also looking into the connection between herbs like curcumin, or turmeric, and their ability to help treat a variety of diseases, including multiple sclerosis. Curcumin, or turmeric, is a natural spice most often used in curry dishes. It has also been used for many years to treat heartburn, stomach pain, bloating, jaundice, headaches, fibromyalgia, fever and even cancer. According to the National Institutes of Medicine, the chemicals found in turmeric reduce swelling and inflammation and offer neuroprotective properties. In 2002, Dr. Chandramohan Natarjan from Vandervilt University, looked at curcumin to treat multiple sclerosis and shared his findings at the annual Experimental Biology 2002 conference. Testing mice with experimental autoimmune encephalomyelitis, or EAE, which is similar to multiple sclerosis in humans, Natarjan administered curcumin in 50 and 100-microgram doses three times a week. They were monitored over the next 30 days and the mice that were given 50 micrograms showed only minor neurological symptoms. The mice that were given the 100-microgram doses showed almost no neurological symptoms at all. Multiple sclerosis is an autoimmune disease that primarily affects the central nervous system -- the brain and the spinal cord. The immune system is designed to protect you from bacteria and viruses. In cases of multiple sclerosis, the nervous system short circuits and attacks the myelin sheath that protects the ends of nerve cells. When the myelin is damaged, the signals that are normally sent through the nerves are slowed down or stopped completely. The cause of multiple sclerosis, or MS, is unknown but according to the National Institutes of Health, there is a higher incidence of MS in northern latitudes, implying a possible environmental component. A 2007 study published in “Advances in Experimental Medicine and Biology” found that curcumin helped to treat symptoms of multiple sclerosis by regulating inflammatory cytokines. 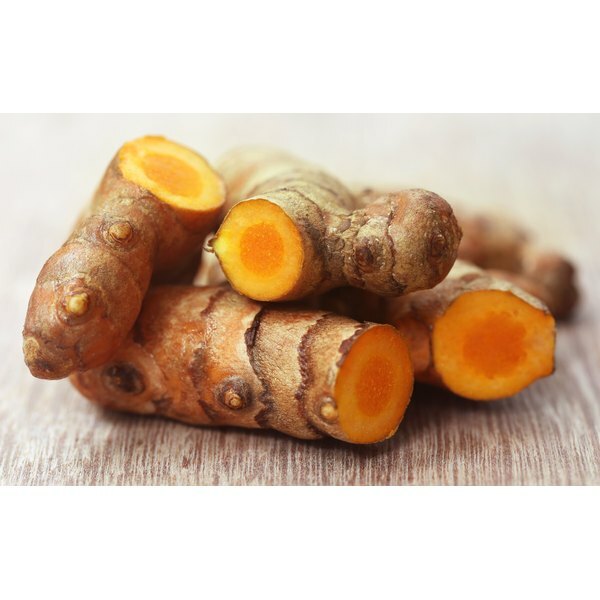 While benefits are traditionally found through regular dietary consumption, researchers believe that, before using purified active compounds of curcumin, more studies need to be conducted in order to determine the appropriate dosage. Another study published in March of 2011 in “International Immunopharmacology” reports that curcumin shows progress in the treatment and pathophysiological progress of multiple sclerosis. Its anti-inflammatory and neuroprotective effects showed potential as protection from multiple sclerosis. A 2009 study published in "International Immunopharacology" showed results similar to the 2002 study by Dr. Chandramohan Natarjan. Using mice with EAE, their research revealed that treatment with curcumin dramatically reduced neurological symptoms. As with any herb or vitamin supplement, the use of curcumin outside of normal cooking should be discussed with your physician. Curcumin is a natural blood thinner and should be used with caution if you are taking anticoagulants, or blood thinning medication, such as Coumadin. Taking these together can put you at risk for bleeding and bruising. There is currently no recommended dose for curcumin in the treatment of multiple sclerosis.